I've been so blessed that despite moving to this new state less than a year ago, I've made a wonderful group of friends. I can count on them for wonderful company, making me laugh, listening to all my stories, and best of all - for countless playdates that entertain me and my children. Score! In fact, we've fallen into a routine of meeting at each others' places weekly. I had a fun idea to host a cupcake decorating playdate and so this party came along. The littles had so much fun decorating their cupcakes and even more fun eating all the sweet treats meant for decorating! 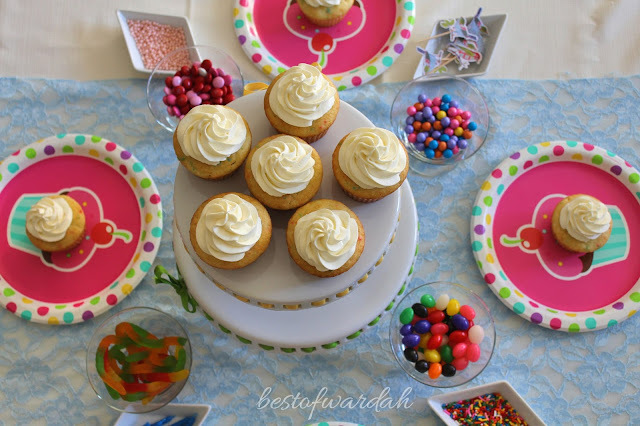 We had such a blast with this cupcake party, I'm sure you will too. Here's how I pulled together this super sweet cupcake decorating party.